Last night, the Rebels started off spring break with some baseball. 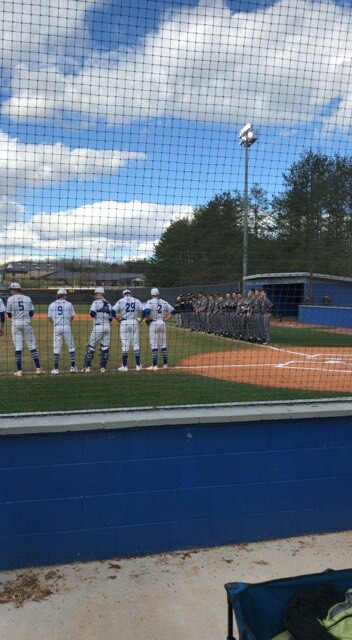 The East Hall Vikings traveled to Fannin County to take on the Rebels for a double header. Fannin had lost their previous game to East Hall and were looking to redeem themselves with a win. Rebel, Matthew Shirah, started off pitching for the Rebels. Shirah walked two and struck out three batters over a total of six innings. The game was going quick, but the score was not progressing for either team. For the first two innings, the score stayed tied at 0-0 where the Rebels had perfect three up three down outs in each inning. East Hall started to swing their bats and get on base in the top of the third inning. In response to the Vikings offense, the Rebels started to pick up their defense. Jack Gobble was behind the plate for the Rebels and brought in their third out of the inning by throwing a runner out on a steal at second base. Fannin’s hitting came alive at the bottom of the third inning. Blake Rogers stepped up to the plate for the Rebels with the bases loaded and hit a bomb to left field. Rogers got a double and brought all three runners home, closing out the third inning with a 4-1 lead over East Hall. The action continued on through the end of the fourth inning. Each team kept adding onto their score and progressing their lead. Chandler Kendall continued the Rebels trend and hit the ball to left field, bringing in a run. Miles Johnson followed Kendall’s lead and hit one to center field, brining Kendall home. Fannin kept their lead over East Hall and finished the inning with a score of 6-3 where it remained the same until the top of the sixth. Fannin held East Hall at the top of the sixth with another three up three down inning. Fannin however was not finishing the inning without another run on the board. Senior, Garrett Rogers, finished the inning by hitting Cody Jacobs home, putting the score at 7-3 with Fannin still in the lead. The senior not only finished the sixth inning, but came in for Shirah on the mound to close out the seventh. Fannin had another perfect three up and three down inning, leaving Rogers striking out one batter, and walking none. The Fannin Rebels wrapped up their first game of the night with a 7-3 victory over the East Hall Vikings. Fannin’s win puts their overall record at 9-10 while East Hall stand at 10-7. Catch Fannin’s next game on Tuesday, April 3 as they travel to take on Lumpkin County at 5:55!